Grand champion Kakuryu defeated sekiwake Tochinoshin on Saturday to take sole lead of the Summer Grand Sumo Tournament with just one day remaining. Kakuryu (13-1) is now one win ahead of Tochinoshin (12-2) in the 15-day tournament at Tokyo's Ryogoku Kokugikan, while grand champion Hakuho (11-3) suffered a shocking loss that cost him his chance of a record-extending 41st championship. Kakuryu will face fellow Mongolian and yokozuna Hakuho in Sunday's final bout in a bid to win back-to-back championships for the first time in his career. Kakuryu lost to Tochinoshin in March, when he won the Spring tournament with a 13-2 record. But Kakuryu did not slip up this time and improved his career record against the Georgian to 22-2. Tochinoshin surrendered an underarm belt hold to Kakuryu, despite bulldozing him toward the edge of the ring with force. Kakuryu resisted and pushed his opponent back, hooked his right leg and threw the 169-kilogram Tochinoshin down. "I kept my body low and stretched my arms," Kakuryu said. "I have to maintain this desire and do my best until the very end." Tochinoshin, who is all but guaranteed promotion to sumo's second-highest rank of ozeki, had a perfect record until suffering a loss to No. 4 maegashira Shodai (9-5) on Friday, when he injured his right wrist. He went to the hospital Saturday morning, but denied the injury played a part in his loss to Kakuryu. The 30-year-old Tochinoshin, who is aiming for his second makuuchi division championship after his triumph in January, will face No. 5 Ikioi (8-6) on Sunday. 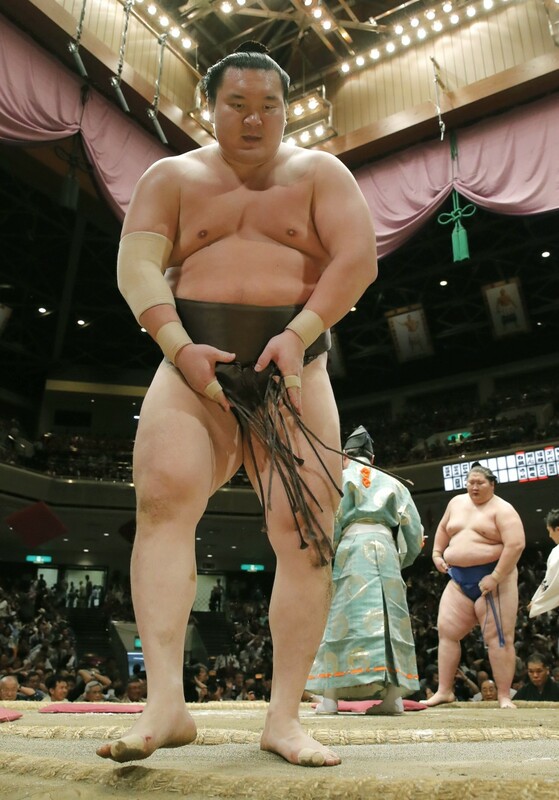 In the day's final bout, Hakuho suffered his third loss, and fell two wins back of Kakuryu. Hakuho won three of the six meets in 2017, but had not been able to complete a full tournament this year due to injury. Sekiwake Ichinojo secured a winning record after holding onto Hakuho's belt with his left hand and pulling his Mongolian compatriot forward. It was his second win over the yokozuna in their 12 career bouts. "It was good that I got a hold of him with my left hand," Ichinojo said. "I wanted to get a winning record earlier. I couldn't wrestle like I wanted to (during the event) so I'm glad." No. 2 maegashira Abi (7-7), who beat Hakuho on Day 6, forced No. 3 Yutakayama (2-12) out of the ring. The 24-year-old has finished two tournaments with 10-5 records since joining the top makuuchi division in January. The Shikoroyama stable wrestler will face No. 8 Yoshikaze (7-7) on Sunday in a bid to post a winning record for his third straight makuuchi division meet. Two popular komusubi lost their bouts. Mitakeumi (8-6) was pushed to the edge and thrown out of the ring by Shodai and had to limp back to the locker room. And Endo (3-9-2), who has been winless since returning to the ring Monday after missing two days with injury, was defeated by No. 4 Chiyotairyu (6-8).